Well, today has sure been an emotional roller-coaster for me. I had a fabulous weekend with friends, but for reasons I will not divulge, my mood’s not so chipper right now. In fact, I was pretty livid earlier, so I thought I would share with you some poetic masterpieces by my favorite Roman poet Catullus. 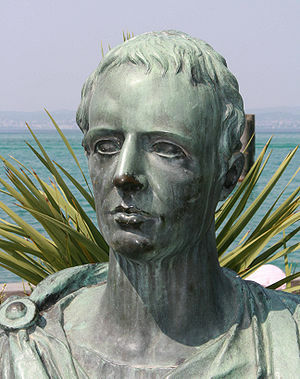 I took a whole class on Catullus at UCSC when I was studying Latin as a Classics minor, but for those of you unfamiliar with the man, he lived circa 84-54 BCE and was familiar with other famous Romans, such as Julius Caesar and Cicero. He’s most known for his honest, often vulgar poetry about his lovers, friends, and enemies. I try to keep my blog pretty G-rated, so I can’t share some of my favorite poems because they’re just too raunchy. Catullus was definitely a hot-head, and he had no problem unleashing his anger upon those who wronged him. So if you’re ever in a bad mood, and feel like reading some dirty Latin poems, I recommend 16 and 42, but beware: they’re definitely NSFW!!! But if you’re not a prude, they’re so hilarious that they’ll cheer you up real quick! So Google those poems…if you dare! However, for today I’m sharing his 12th poem, in which he insults a man named Asinius Marrucinus for stealing his precious dinner napkin. Sure, he’s petty and melodramatic, but the man can write! Makes me miss studying Latin! hoc salsum esse putas? fugit te, inepte! verum est mnemosynum mei sodalis. et Veraniolum meum et Fabullum. Asinius Marrucinus, you do not make a pretty use of your left hand: you steal linen napkins of the neglectful in joke and drink. Do you think that this is funny? It runs away from you, silly man: the thing is as vulgar and unattractive as you like. You do not believe me? Believe your brother Pollio, who would want your thefts to be exchanged for one talent of silver: for the boy is filled of charms and jokes. Wherefore, either expect 300 hendecasyllables, or send back my napkin to me, which does not move me at its value, but it is a souvenir of my companions. For Fabullus and Veranius sent Saetaban napkins to me as a gift from Hiberia: it is essential that I love these as I love my Fabullus and little Veranius. This entry was posted in Masterpiece Monday, Poetry and tagged Catullus, Latin, Poetry, Roman, University of California Santa Cruz by Book Club Babe. Bookmark the permalink. Nice to hear from another Latin lover! Thanks for reading! I love Catullus. Definitely helped make Latin class interesting enough to continue with it (although my excellent teacher, a Mr. Bryant, was the main reason). I’m boring though, I probably can’t be budged from my position that “odi et amo…” is his best poem. Oh, and uh, mellon. Naturally.